This page describes an exclusive offer – if you’re based in Denmark – for you to ensure a minimum 30% discount on a Molecular Devices absorbance microplate reader. In this exclusive agreement, Molecular Devices will guarantee a 30% discount to anyone who signs up using the form below. Register your interest before December 7th 2018. Otherwise you could miss out. With Molecular Devices instruments, you get many of these applications with ready-to-go protocols on the instrument’s software. PathCheck: PathCheck® Sensor is an award-winning technology that measures the fluid level in every well of a microplate. This allows users to normalize all absorbance values to the same path length. This corrects for pipetting errors and volume differences across a microplate. Added bonus of PathCheck – it allows users to check multichannel pipettes for volume errors. Micro-Volume Microplate: a high-throughput solution for low-volume measurement of DNA, RNA and protein samples. Up to sixty-four 2 μL samples at a time. The Software: SoftMax® Pro software is the gold standard of microplate data analysis software. In a world where many instruments share similar technical specifications, great software makes the difference. User-friendly SoftMax Pro gets you off to a quick start in doing laboratory analysis with over 160 ready protocols. FDA 21 CFR Part 11 compliance tools are available for regulated laboratories. Laboratory Integration: Plate washers and stackers are available for walkaway convenience. Integration with lab robotics from other providers is possible, e.g. Beckman Coulter, Thermo, Hamilton, Agilent etc. From low- to high-throughput, there is a reader that suits your needs. What Molecular Devices Absorbance Readers are Covered by this Offer? 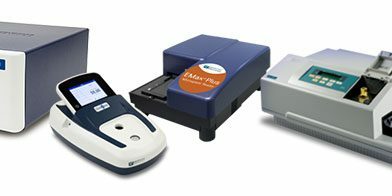 The 30% discount offer covers all Molecular Devices microplate readers, including the SpectraMax ABS or ABS Plus, SpectraMax QuickDrop, EMax Plus, VersaMax, SpectraMax 190, or SpectraMax Plus 384. What Happens Once You’ve Applied for Your Discount? After filling in the contact form below you will be contacted by the Danish representative of Molecular Devices to discuss your requirements. All discussions about your needs will be with Molecular Devices. As you would expect, you will also be able to run an instrument demo before you decide whether you want to purchase. You risk nothing: if you decide not to purchase an instrument, that’s totally fine. No hard sell, no hidden prices. We just hope you get an instrument that enhances your work and moves your projects forward. If you have any extra questions, need to arrange a lab demo, etc. please include that in your message below. Get in touch if you have any additional questions about this offer. The Molecular Devices website is a great resource to learn about their absorbance instruments. You can get all the information you need right here. Purchase is subject to Molecular Devices standard terms and conditions of sale. Get up to 30% discount off the current list price of a new single-mode absorbance microplate reader from Molecular Devices. Offer includes the SpectraMax ABS or ABS Plus, SpectraMax QuickDrop, EMax Plus, VersaMax, SpectraMax 190, or SpectraMax Plus 384. The exact percentage discount will depend on the model of microplate reader being purchased, and your currency. Valid September 25, 2018 through December 7, 2018. Purchase order must reference promotion code EU-SMA30-Q418 and must be received by December 7, 2018 for delivery by December 21, 2018. The offer does not include any other options and accessories and applies to standard parts only. The offer does not include shipping and handling, installation or training. This promotion cannot be combined with other promotions or discounts. No substitutions or swap outs are allowed. The offer is not convertible to cash. Offer is not valid for standing orders. All prices exclude local tax which is the responsibility of the customer. This offer is valid only to customers in Europe when buying directly from Molecular Devices. Delivery terms are FCA (Free Carrier) Seller’s shipping facility (Incoterms 2010). Offer void where prohibited. All Molecular Devices products are for research use only. Other restrictions may apply. For our full standard terms and conditions of sale, please visit our website. Great lab tools lead to great science. Do You Know Anything About High-content stem cell imaging techniques and tools? 30/06/16: NanoDrop Users – why settle for a single drop?